Hard to believe we had to debate the impact of foreign money just a few short months ago. The profits before people real estate cartel beat home the message loud and clear, no foreign buyers, BUILD MORE!!! MORE!!! So we obeyed Bob the Builder. More and more pre sale developments came on to the market only to be sold to VIP buyers for record prices. To the cartels dismay Christy Clark and Shrimp De Jong introduced the foreign buyers tax. The results, staggering. The stats solidified what most of us with two eyes could see. Foreign buyers accounted for 13.2% of sales across Metro Vancouver, 24% in Burnaby, and a staggering 25% in Richmond. Since the tax, foreign buyers now make up just 3% of total transactions across Metro Vancouver, 5.9% in Burnaby, and 6.7% in Richmond. Foreign buyers have virtually disappeared. It seems only the desperate remain. Willing to pay any obscene amount to claim their stake. Despite foreign buyers out spending us by $242,476 on average, sales have dropped 37% in Burnaby and 33% in Richmond. Prices are now on the move, especially at the high end. 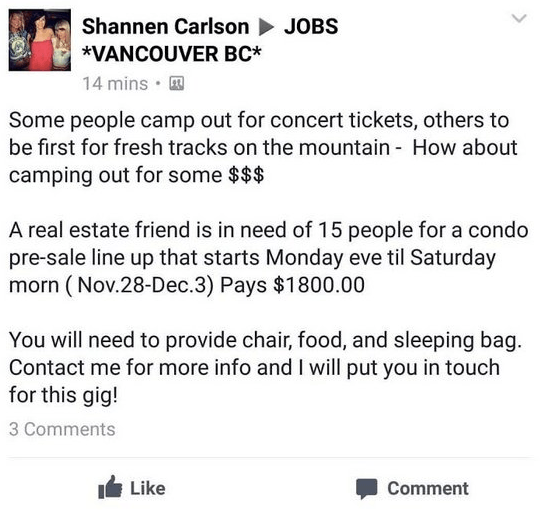 Condo developer offers $1800 to camp out at pre sale. A lowly tactic for a pre sale that would have sold regardless. Foreign capital is only one of the many pillars driving this market but it was a significant one. The fact it was denied by most in the industry who then accused others of race baiting was sad and self serving. Let’s move on. Get my best work sent to your inbox here.